If you could change one leadership behavior today that would make a better difference in your work or home, what would it be? One way to learn about your behavior is through feedback. Feedback has long been an essential element of helping people grow and learn. Feedback that is constructive and honest can be a gift, if provided gracefully by a trusted source. Feedback, however, focuses on the past rather than on the great opportunities that exist for the future. In addition to feedback, what other options exist to help expose a behavior shortfall? Marshall Goldsmith introduced the idea of “feedforward” a number of years ago. Marshall is one of the top executive coaches in America according to Forbes, Wall Street Journal, USA Today, and others. I had the great fortune of meeting Marshall in 2003 when he volunteered his time to coach Army General Officers (Marshall Goldsmith Group). I still have pages of notes from those sessions and put into practice many of his recommendations over the years. Marshall’s powerful feedforward technique is one you can implement today – right now – to help you become a better leader. 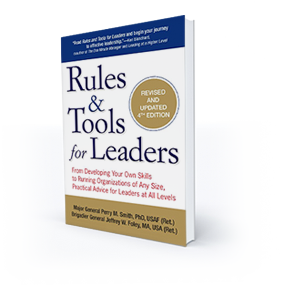 This approach has been used with tremendous success for many years, by thousands of people at all levels of organizations, including CEOs and other senior leaders of Fortune 500 companies. If you are interested in learning more about feedforward, read on. The feedforward technique is so good, I wanted to share with you how it works. Pick one behavior. 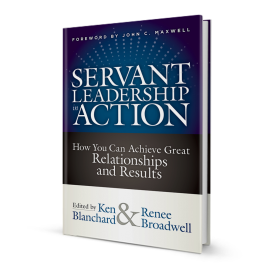 Choose a leadership behavior that you want to change – one that will make a significant, positive difference in your life. Example behaviors include: treat others with more respect, build trust, be a better listener, delegate more effectively, manage time better, hold others accountable, or deal with conflict. Ask. Describe the behavior you want to change such as “I want to be a better listener” and ask for 1-2 suggestions for the future that might help you achieve a positive change. Ask your boss, your subordinates, peers, friends or family members. Feedback about the past is not allowed – only ideas for the future. It takes courage and humility to ask others for suggestions to help you, especially your subordinates. You will likely be surprised at the ideas you receive. Listen. Listen attentively to the suggestions and take notes. Do not comment on them or critique them in any way. Do not try to defend your past actions. Do not even make positive judgmental statements, such as “that’s a good idea.” Accept others’ opinions as perceptions of reality. I know – not easy. Just listen with the intent to be influenced. Thank. Thank those who have offered you suggestions. This is not easy but essential. It takes courage for others to provide you their suggestions and they deserve your thanks. Your genuine commitment to improve your behavior is demonstrated by expressing your gratitude to those who want to help you. Think. Take the time to think about the suggestions you received. Do not overreact. Determine which ones could have the most impact. Consider themes that may have developed from the responses. Respond. Determine how you are going to respond to the suggestions received. It takes courage to share with those around you, especially your subordinates, your plan but they deserve to know. Change. If you want to improve – you must change your behavior. You are never going to get in better physical shape by watching others work out at the gym. You must actually DO more of something, less of something, or something entirely new. Follow-up. Engage those around you on a regular, disciplined basis to learn if you are executing the changes in behavior that you said you were going to do. Engaging follow-up is the best way to show you are serious about change. The responses you receive on a regular basis will be enlightening and will guide you on how to adjust your actions. Success with this feedforward technique requires courage, humility, and discipline on the part of the leader. Over time, you will determine your level of success by not just your own belief that you have changed, but also by how others perceive your change in behavior. The big question: Am I willing at this time to make the investment required to make a positive difference in how I lead? I encourage you to give feedforward a try!